Looking for a delicious plant-based dinner option? 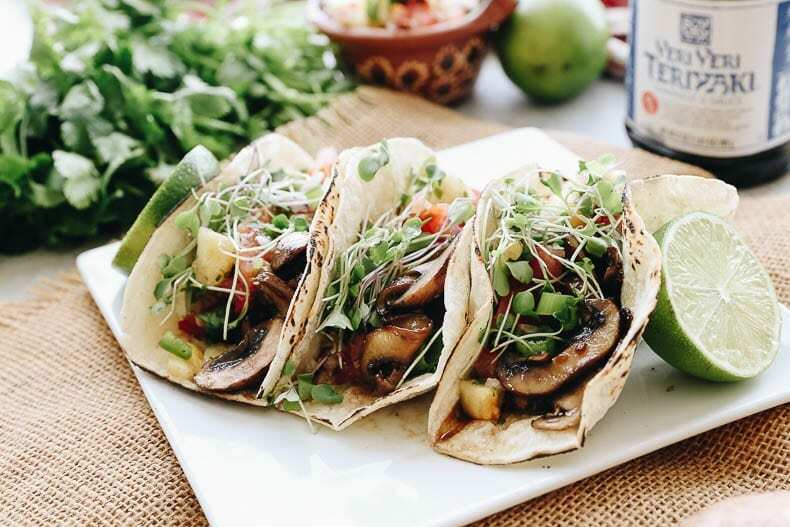 Look no further than these Mushroom Teriyaki Tacos with Pineapple Salsa. A healthy, veggie-focused meal full of hearty and nutritious ingredients, but not short on flavor! Since sharing this post on going plant-based then eating more meat again, I’ve gotten a lot of questions about where my diet is at these days. Am I still eating meat? How much? How has my diet changed since experimenting with more plant-based meals? I think the last question is probably the most important. The truth is, I don’t think about my diet all that much. I don’t label it, I eat what makes me feel great and I don’t dwell or feel guilt about what I don’t. I also know that this can change at any moment. I’m fortunate to not be dealing with any major health issues and that allows me to be a lot more flexible in my diet choices. If this wasn’t the case, I’m sure what appeared on my plate would look very different. But in terms of how it’s changed from my own experimentation in the past, I can say that while I definitely eat meat and prefer to have animal protein in my diet, I also don’t feel like I need it at every meal. That’s the nice thing about experimentation, you discover myths and stories you’ve been telling yourself that just simply don’t work for you. This is especially true when it comes to our intake of animal protein. Now don’t get me wrong, I eat all meat and probably have some form of animal protein everyday because it makes me feel best, I also have learned that the whole “you need animal protein with every meal” myth simply isn’t true. Experimenting with more plant-based eating proved that to me. While it wasn’t sustainable for my life, I learned how to cook delicious, veggie-focused meals that were healthy and satisfying. I now feel comfortable cooking vegetarian and sometimes vegan meals that are just as hearty as their meat-focused counterparts. And that feels really awesome. 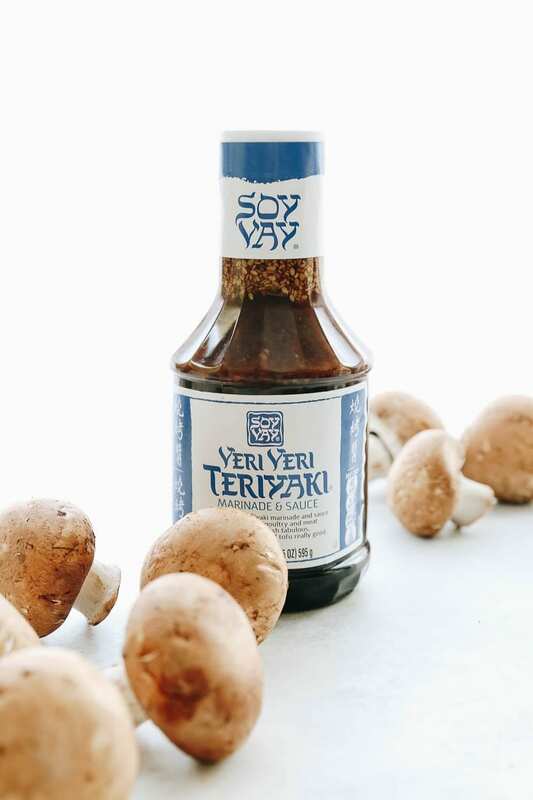 As I was looking at the last few recipes I’ve shared using my favorite Soy Vay marinades I noticed that both used animal protein. My 20-Minute Teriyaki Chicken is a classic in our house and you really can’t go wrong with the Hoisin Garlic Salmon, however I also don’t believe you can only use the marinade on meat and seafood. 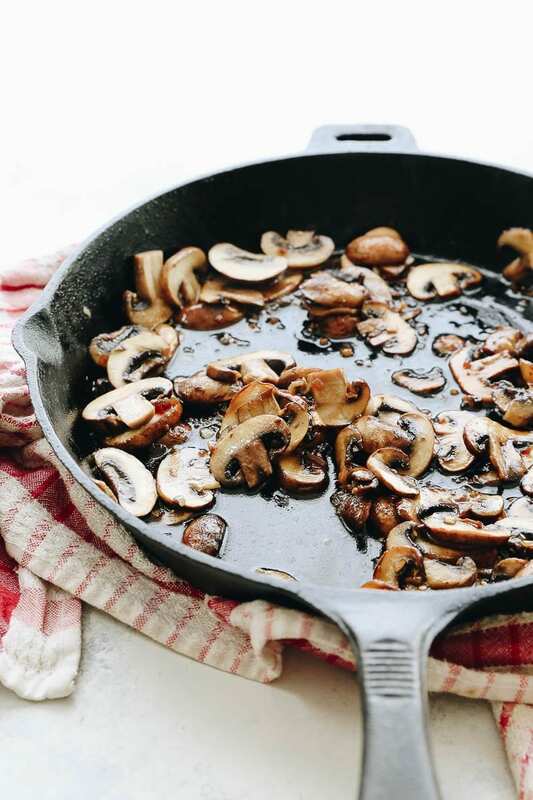 Veggies, and mushrooms especially can be a hearty option for a plant-based meal and especially if you don’t eat meat at all since they come pretty close in texture. 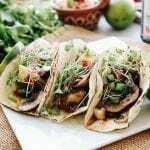 They’re also topped with my Easy Pineapple Salsa and some greens to fill out the taco for a healthy and filling meal. This is one of those recipes that convinces people that vegetarian cooking can actually be delicious. A lot of people ask me what “intuitive eating” mean and honestly I think it’s a really individualized experience. To me, it means not analyzing everything that I eat, but instead living it and making choices day-by-day. It’s only when I’m asked about it do I really think about it. I know what’s important to me, I know what I think is delicious and I know what feels sustainable to me. My hope is that you can all find that same sense of balance too. Hopefully all three of my recipes using Soy Vay can help inspire this in all of you. Happy eating! Add mushrooms and cook on medium-high for 5 minutes. Add Veri Veri Teriyaki sauce and simmer for 5 more minutes. Heat up tortillas on stove top or in microwave. Add mushrooms and top with salsa. What does intuitive eating mean to you? How has your diet changed over the years? 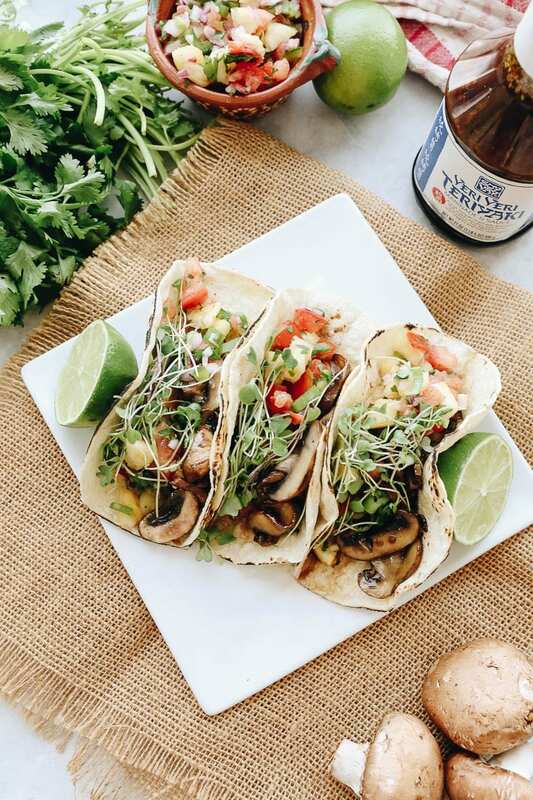 The post Mushroom Teriyaki Tacos with Pineapple Salsa appeared first on The Healthy Maven.